The Bichon Frise (meaning ‘curly lap dog’, also known as a ‘Bichon Tenerife’ or ‘Bichon a Poil Frise’, if you want to be fancy about it) descends from the Barbet, a Mediterranean breed. The Barbet was cross bred with a small coated white breed to derive the Bichon. Bichons were classified under four categories: the Havanese, Bolognese, Maltaise, and Tenerife, from which the Bichon Frise ultimately descended. They were brought home from the Canary Islands by Italian sailors in the 1300’s and became popular pets for the French and Italian upper class, including King Francis I. Bichon Frises sank in popularity through World War I to the point of nearly being lost, but survived via their popularity as tricksters, accompanying street minstrels. French breeders in the 1930’s made an effort to revive the breed, which finally took off in popularity after being brought to America in the 1950’s. The Bichon Frise has a shoulder height of 23-30 cm (9-12 in) and weighs 3-5 kg (7-12 lbs). It is a short, puffy breed with round, dark eyes, drop ears, a furry tail curled over the back, and round feet. Bichon Frises have long, elegant necks, strong chests, short muzzles, and a scissors bite. They have a dark halo around the eyes and a dark nose and lips, giving an inquisitive facial expression. The Bichon Frise has a white colored double coat consisting of a soft, silky, dense undercoat and coarse, curly, outer coat. The coat springs back when patted and is puffy in appearance. The coat may have cream or apricot shadings, which will fade during the puppy’s first year. 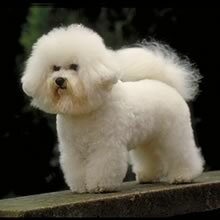 The Bichon Frise is highly hypoallergenic and does not shed, making it a good breed for those with allergies. There are two popular Bichon Frise grooming styles: a short, poodle-like coat or a long, puffy coat for a more rounded appearance. The Bichon Frise is sensitive, responsive, affectionate, and abundantly playful. It is a perky, jumpy, happy dog that loves companionship and is happy to cuddle up. Bichon Frises have an easy, happy disposition. The Bichon Frise is sensitive, responsive, affectionate, and abundantly playful. It is a perky, jumpy, happy dog that loves companionship and is happy to cuddle up. Bichon Frises have an easy, happy disposition. The Bichon Frise is eager to make friends with strangers, other dogs and children. It may bark frequently or tend to nip when playing. Bichon Frises make an excellent addition to the family. Like cats, they have sudden spikes of energy which cause them to run wildly around the house. You can find Bichonfrise puppies priced from $300 USD to $3000 USD with one of our credible breeders. Browse through our breeder's listings and find your perfect puppy at the perfect price. The Bichon Frise is eager to make friends with strangers, other dogs and children. It may bark frequently or tend to nip when playing. Bichon Frises make an excellent addition to the family. Like cats, they have sudden spikes of energy which cause them to run wildly around the house. The Bichon Frise’s coat needs to be brushed and combed every other day and trimmed every two months. Bichon Frises should be groomed from an early age so that they are at ease with the process, since they will undergo it frequently. The grooming process should be made as comfortable as possible. The Bichon Frise’s Foot and ear hair should also be trimmed occasionally, and the hind area should be cleaned with a damp cloth. Bichon Frises must have plenty of human companionship. They may have allergies or be sensitive to flea bites. Bichon Frises have a life span of 12-13 years and have litters of 4-5 pups. The Bichon Frise is highly intelligent, making training a fairly simple task. It is able to learn a wide variety of tricks. Males may be easier to train than females. Bichon Frises can be difficult to house train; crate training may be a successful technique. The Bichon Frise is an active dog that needs daily exercise. Despite its small size, it is eager to play vigorous indoor games, romp in the yard, or take short walks on the leash. Bichon Frises can adapt to apartment life fairly easily. Bichonfrise Puppies for Sale - Shipped Worldwide! Finding the right Bichonfrise puppy can be dog gone hard work. PuppyFind® provides a convenient and efficient means of selecting and purchasing the perfect Bichonfrise puppy (or Bichonfrise puppies) from the comfort of your home, 24 hours a day, 7 days a week. Take advantage of our PuppySearch or leisurely browse our directory of hundreds of dog breeds, Bichonfrise dog breeders, Bichonfrise dogs for adoption, and Bichonfrise puppy for sale listings with photos and detailed descriptions. Some Bichonfrise puppies for sale may be shipped Worldwide and include crate and veterinarian checkup. Many Bichonfrise dog breeders with puppies for sale also offer a health guarantee. With thousands of Bichonfrise puppies for sale and hundreds of Bichonfrise dog breeders, you're sure to find the perfect Bichonfrise puppy.